In 2012, I made a list of 37 birthday wishes, and the first one was this: I wish for a second lifetime with my Travis. This is my first birthday post-divorce. I can’t say it’s the first one without him, or the first one I’ve spent alone, because if I didn’t plan something for my own birthday, then we wouldn’t do anything. I always made his day nice, with a surprise party with friends the year he went through cancer treatments. My day tended to go by like any other day, without notice. This was a bitter thing, last year, because I’d looked forward to my 42nd birthday since I was 9 years old, and read The Hitch-Hiker’s Guide to the Galaxy for the first time. And we did nothing, even though I asked. This imbalance of care was one of the many things that finally destabilized our marriage. I didn’t feel loved. He went out of his way to take care of any woman who wasn’t me. Turns out he took special care of one particular 23 year old. In fact, he made sure she had a couple of nice birthdays, while he was at it. Because of course he did. But I digress. It’s my day, and I’m not going to spend it talking about them. I’m not writing today because it’s my birthday, and I’m sad. I can’t possibly write while sad. I definitely can’t use writing to help me process it, right? Writing is the best way for me to process anything. This is something I seem to have to relearn, over and over. Is it a safe bet to assume, since you’re also participating in this writing challenge, that your mind works the same way? The act of writing indexes my memories and makes them richer. I get to enjoy the experiences again when I think about them in detail while writing. Often I don’t know what I think or how I feel until I write my way through it. I think more deeply, and feel more easily with a pen in my hand. When I don’t write, I don’t process anything. It just kind of pings off me, instead. This day is so hard. I’ve decided to let myself grieve the situation, but also look for a way to enjoy the day. * Calling family and friends for connection. * Pie and coffee, because pie. And coffee. * Load ink into each fountain pen, and put it next to a new journal. * Sponsoring a child in need. I want to make a difference in my one wild and precious life. I’m doing things to mark the day, instead of pretending it’s not happening. I’ve never minded aging. I don’t really think about it, honestly, the same way I’m not shocked when I get up and the world is still turning. I felt older and more tired in my 20s than I did in my 30s. I’m going to make my 40s into a good life. Today I will try to soften into feeling what comes to me, instead of shutting it down. And I’ll write, even though I’m sad. In case you’re having a hard time today, too, here is a sad-funny. I think this snake and I would be buds. Such a sweet little danger noodle. 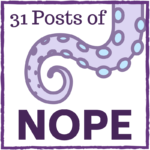 This entry was posted in Blogging challenge, Depression, Five Minute Friday, General, Life after divorce, Post of Nope, Self care, Write 31 Days, Writers block, Writing challenge. Bookmark the permalink. Thanks for stopping over to my blog so I could come here to meet you. I’m hoping your birthday turned out fabulous. You deserve to be celebrated. Looking forward to catching up on your posts. Thank you! I ruled over the day with an iron fist! (Inside a velvet glove.) And there was much pumpkin pie to be had by all. I thought of more to say: falling in love with myself, really becoming my own best friend, has inoculated me from the feelings and despair you describe. That’s not to say I never get lonely anymore, I do, but not with the intensity and bone-crushing pain that those feelings used to bring. Celebrating on your terms is one of the ways to begin forming the friendship with yourself. It will be the best gift you give yourself! Happy Celebrating! Aw, thank you! How awesome are you?? So awesome. It’s a work in progress. I’m starting to accept that the last several years of marriage, I didn’t like myself all that much. I didn’t even recognize myself. I’d been ground down until I was just an echo. Part of this writing challenge is me daring myself to find my voice, and own it, even if (WHEN) I make mistakes. Thank you for helping me be braver, in this area. Happy Birthday! 🙂 Birthdays are generally pretty depressing to me, too. I like that you have taken steps to make it special. For some reason, it seems that a Birthday always points out all of the people that are not remembering me on that specific day. I’m not sure why that is, because if they aren’t thinking of me on my birthday, they probably aren’t thinking of me on any other given day. I hope this day turns out to be better than you are anticipating, and I pray you find peace, healing and happiness. Oh, I love the quote you shared! That’s wonderful. 🙂 Thank you for your kind words and empathy, Kara. I see you, and I appreciate you. Sending happy birthdays to you! Sounds like it’s a tough day, but yay for celebrating with a little kindness to yourself. Hope this day turns out better than you ever imagined. Thank you so much, Jen! I feel like I had a virtual birthday party, with everyone who commented. 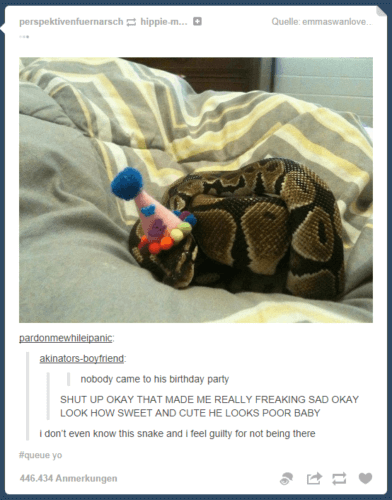 I was feeling sorry for you until the snake pic! (Can’t stand snakes.) I’m sorry your life didn’t go according to plan but sounds like you are better off without your husband but that won’t have made the separation and divorce any easier. Hope you got to connect with family and friends and yeah pie is good. Happy 42nd Birthday! Today, my grandmother turned 95. It’s a big day. I love that you read Hitchhiker’s Guide to the Galaxy at age 9. I’m impressed. No wonder you have such a sense of humor. But have you seen the movie?? DON’T. Sending you a birthday hug from afar. I love this quote “The act of writing indexes my memories and makes them richer. ” so very true! It’s good to find others in the same boat, of thinking best in text, Jackie. Thank you!